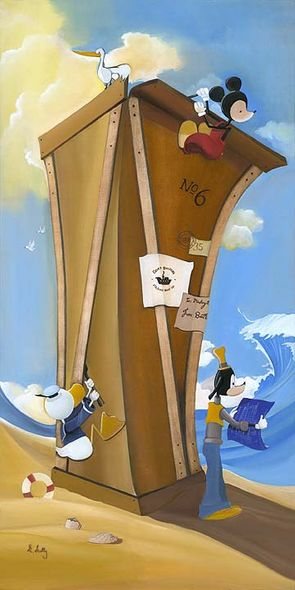 Katie Kelly Handsigned and Numbered Limited Edition Disney Fine Art Canvas Giclee:"Boat Builders"
About the Artist: Katie has been interested in illustration for about as long as she can remember, but there was a moment when she was nine years old that crystallized her future artistic endeavors. During a family holiday her grandma displayed a set of illustrations and political cartoons that her grandfather had created during World War Two. Katie was captivated by her grandfather's artistic abilities and felt an overwhelming desire to paint and draw as he did. She knew, from that day forward, that art would be a crucial part of her life. She began sketching seriously that very day and has been at it ever since.Katie's parents have been incredibly supportive throughout the course of her artistic evolution. They allowed her to paint murals over their walls, portraits on her furniture, and ink sketches on her jeans.They encouraged her to think outside the box, which is where, Katie says, "I have always been most comfortable. " Katie believes that art has enabled her to express her inner self to others. "When I am sketching or painting," she explains, "my mind is clear and I am at peace. I truly enjoy what I do and I hope to convey these joyous feelings to others through my work. I want my paintings to be places where people would like to go, places that exude happiness. "Her style is best described as happy, whimsical, quirky, and a little bit twisted. Katie often exaggerates certain elements within her paintings because she feels that unnatural characterizations can evoke stronger emotions than those rendered exactly, enabling people to connect with and understand them from unique perspectives. She likes endowing natural elements such as trees, water, and the sky with human traits while, on the other hand, she gives rigid - almost robotic - qualities to human characters. "I am excited to be a part of the Disney team," says Katie. "My relationship with Disney stems from an illustration I created for a book that I am writing." She explains that the painting portrays a Depression-era dinner scene in which a little girl is being served a mountain of sweet treats by a parade of butlers and maids.Her good friend Noah happened to see this piece and was instantly reminded of the Alice in Wonderland tea party.After some collaboration between the two artists, she painted the tea party scene using her own interpretation of the Alice in Wonderland characters. It was from this painting that Katie's unique twist on Disney characters was born. Katie says that she is blessed to have the opportunity to work with Disney and it is truly an honor to be working with such a great group of people. Disney embodies happiness in every sense of the word and it brings me great joy to be a part of that happiness. "She acknowledges that countless people have helped her along the way and she appreciates their assistance more than words can express. "God has blessed Katie with a gift that she hopes to share with others. "Someone once told me," she explains,"that one of the best ways to give back is to use your God-given talents to help others, whether you are a seamstress, a baker, or - in my case - a painter. " God has blessed Katie with a gift that she hopes to share with others.